In her excellent article on Wikipedia (“Let Your Questioning Start with Wikipedia,” March/April 2017), Susan Gerbic describes this wonderful resource to combat ignorance. I am always amazed at how easy it is to find an answer, compared to my school-age years, when I felt consigned to the World Book Encyclopedia. However, she didn’t explain the need for caution. Several years ago, during a Super Bowl, I was curious about the age of the half time rock performer. And there, in the first paragraph, it stated that he was, “born and anally raped….” I was stunned, and actually believed that the poor man had been a victim of sexual abuse. Granted, it seemed an odd way to write it, and lo and behold, the next day, it was edited out. Ms. Gerbic makes the point that statements need to be referenced. And of course then one can search the reference. Nonetheless, it doesn’t always stop the unscrupulous from contaminating this incredible resource. Readers need to remain skeptical. Skeptical Inquirer (CSI) received this letter to the editor about my recent article. My very first letter to the editor about me. I’m actually very flattered. And I really want to use this opportunity to explain the inner workings of Wikipedia and how everyone is needed to help police it. First off, this happened several years ago, and I seriously did not expect Mr. Diamond to know what to do when he spotted vandalism on Wikipedia. But he and everyone reading this will by the time you are done reading. Every edit that has ever been done on Wikipedia is public. It takes seconds to discover who made the edit and when. I should say that “who” is relative; it could be an anonymous ISP address. Most vandalism reverts are done by robots on Wikipedia. They do thousands a day. I don’t know who this rock star Super Bowl performer Mr. Diamond is talking about is, but let’s see if we can figure it out. Then we will be able to look into this further. I’m going to start by searching for Super Bowl on Wikipedia. I see a link for Super Bowl entertainers during half time. Let’s look through that list. Remember he says “several years ago” and “of the half time rock performer,” which makes it sound singular, not a part of a group. We can narrow it down even further as Mr. Diamond said he looked on Wikipedia to find more information, and Wikipedia was invented in 2001. So it had to be after 2001. On the top right side of every Wikipedia page (you do not need an account; everyone can see this tab if they are looking at a desktop screen), click on the “View history” tab. You will be taken to a page that shows every edit ever made to the page. We are looking for February 1, 2015, as well as the days before and after. On the left side you will see current and previous. You can mouse over the “prev” and without clicking on the link you should see a preview of the edit that was made as well as the edit that was there before. Do this so you can quickly find the change. I don’t see the vandalism Mr. Diamond mentions. But I do see that during the Super Bowl this was added. The vandalism was added on Feb 1, 2015, at 16:01 by someone named Gman261 and was reverted back to normal at 16:02 by someone named Gloss. I can click on the “contribs” next to Gman261’s username and I will be transferred to a “User contributions” page. This specific one tells me that Gman261’s only edit on Wikipedia under this user name was the one on Lenny Kravitz’s Wikipedia page. It was a mobile web edit. This is interesting to look at, because most people who do vandalism will do a string of edits all in a row. If Gman261 had done so, we would be able to quickly look at all of them and revert them in seconds if they were vandalism. One more note before we leave the Kravitz Wikipedia page. If we click on the “talk” link next to Gman261’s name we will see this very polite note from Gloss. “Hello, I’m Gloss. I wanted to let you know that I undid one or more of your recent contributions to Lenny Kravitz that do not appear constructive. If you would like to experiment, please use the sandbox. If you think I made a mistake, or if you have any questions, you can leave me a message on my talk page. Who says that Wikipedia editors aren’t polite? The rule on Wikipedia is to always assume good faith. If only this were a rule in the real world. This was an edit made by an anonymous ISP address that lasted under a minute on the Wikipedia page before it was reverted by a robot. 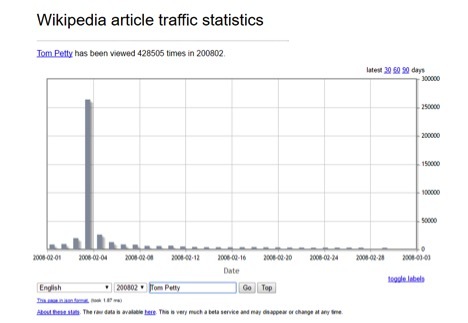 Once the Super Bowl was over, the Wikipedia page went back to about thirty edits a month. 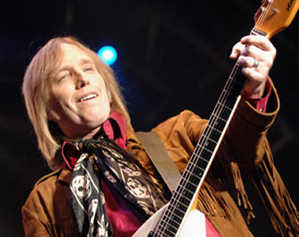 Lastly, let’s look at Tom Petty, February 3, 2008. At 17:11 we find the edit that Mr. Diamond talked about. Made by ISP 76.111.36.135. At 17:12, the edit was reverted by someone named Trichotomous. What I suspect is that Mr. Diamond was watching the Super Bowl with millions of others around the world, and thought “hmmm, how old is Tom Petty now?,” clicked on his Wikipedia page, and just happened to see the page that had the vandalism on it. If he had looked a minute before or a minute after, he would not have seen that specific vandalism. This was a snapshot of a moment in time. Here is an interesting statistic. Mr. Diamond wasn’t alone in looking at Tom Petty’s Wikipedia page that day. Normally, the Tom Petty page receives 4,000 views a day. But on this specific day the same page received 263,656 views. Trolls know this, and are more likely to vandalize when they know the page is at its peak of popularity. It is possible that a Wikipedia editor could ask for a lock on editing for a day to keep trolls off. But Wikipedia does not like to do this. They know that the page will be reverted quickly when vandalism happens. They really don’t want to keep the page from receiving good changes also. The way this all works is that editors put Wikipedia pages that interest them on their personal watchlist. And then anytime there is a change to that specific Wikipedia page they will see it on their watchlist. If it is vandalism, then it takes two clicks to revert it. Only seconds. Also, robots (bots) troll Wikipedia looking for vandalism. Each bot has its own special purpose, maybe looking for the word “jerk” that is submitted as the only addition to the page. The way bots work is fascinating, and this article talks about how the bots are deleting each other’s edits. This is something we really need to be talking more about as we get closer to self-driving cars and artificial intelligence. So, for those of you interested in helping out Wikipedia and keeping it clean, I suggest this article written by Tim Farley, who inspired me to start editing Wikipedia. To sum up Tim’s article: If you see vandalism, hit the edit (some say edit source) tab on the top left side of the Wikipedia page. You will probably be looking at code. Find the vandalism on the page and delete it. Go to the bottom of the page and leave a reason why you are making this edit. It can be as simple as “removing vandalism” and then click save. Lastly, pat yourself on the back. Really, there is little to repairing vandalism on Wikipedia. You really can’t break anything. If you do something wrong, then someone will come along and fix it. Depending on how popular the Wikipedia page is, the edit might sit there unchanged for days or weeks. So, when you see it, fix it. Thank you, Mr. Diamond, for your letter. It was fun to investigate.